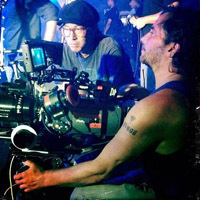 Last week, Billboard.com announced that Green Day was going to be working with director Sam Bayer for their "Oh Love" music video amidst the headlining news of the band working on two new documentaries. Not many specifics are known just yet about Green Day's latest music video, but here is a quick roundup of the information that we know so far. We first learned through whispers on Twitter last Friday that Green Day was shooting the video this past weekend in a warehouse located in a suburb of Los Angeles, California. We assume the video isn't going to be a straight up performance video, it will have some type of story line to it after a few actors tweeted that they would be involved in the video. Alysha Nett, Hattie Watson, and Trent Bruce are members of the cast that we were able to confirm. Personally I'm really excited to see how this video will turn out, I have a lot of faith in Sam Bayer seeing as he has directed some of my favorite music videos including "American Idiot", "Holiday", "Smells Like Teen Sprit" (by Nirvana), and of course, Green Day's first official concert DVD Bullet in a Bible. Also, we have confirmed that the video will be released in the first week of August, below are a few photos from the set to tide you over until then. 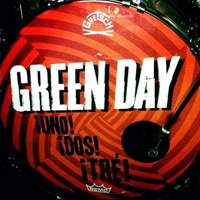 Tre Cool's new kick drum head for ¡Uno!, ¡Dos!, ¡Tre!